Version 1.78 now supports order types. Restaurants can utilise this feature to designate an order as Eat-In, Take-Out or any other configurable type. The order type is clearly printed on order tickets to ensure that it is noticed by your preparation staff. The order type is prompted for when a new order is created. It can also be updated at any time on the Order Details screen. 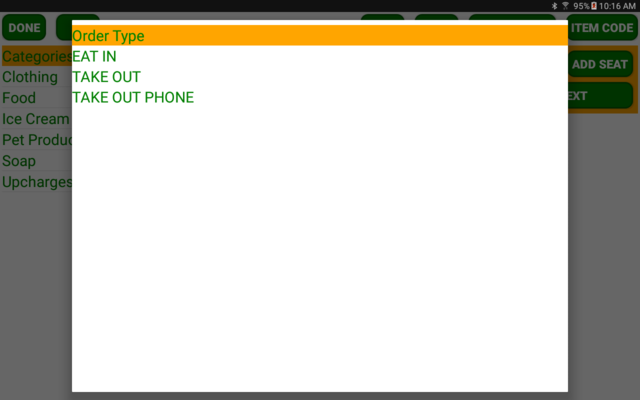 Enable this feature in Basic Setup, Devices, Edit your specific individual device, General section, Order Types. This version also includes some minor enhancements for salons, spas and groomers. The appointment book has a new appointment status of "No Show". The status is displayed in the same colour as a cancelled appointment. Creating, updating and deleting appointments is now logged against the operator performing the task. This will ensure accountability for any schedule changes. POS-n-go, Small merchants love us!